Fitting a bulkhead, cabin sole, floor timber, or any piece of wood against the interior surfaces of a hull is a challenge for many marine-industry personnel. Even those possessing carpentry skills often have limited exposure to dealing with the curves and changing bevels so common in boat construction. After years of teaching boatbuilding at The Landing School in Arundel, Maine, I’ve developed a method that enables novice builders to achieve consistently good results in most hard-to-fit situations. If they’re careful with all the steps described below, the target piece will fit into the hull with a minimum of fussing. Absent my method, then the process of fitting the piece can feel seemingly endless: you remove it, shave it, try it again, repeat. After a while, reference marks can be lost—at which point the fitting process becomes a frustrating mystery. My method eliminates the frustration and the mystery. Let’s get started. Here are the tools needed: a block plane, saber saw, dividers, 6″ (152mm) ruler, laser level, and a sharp pencil. The materials needed are: a half sheet of thin lauan plywood cut into 4″ (102mm) strips, a hot-melt-glue gun, and glue sticks. 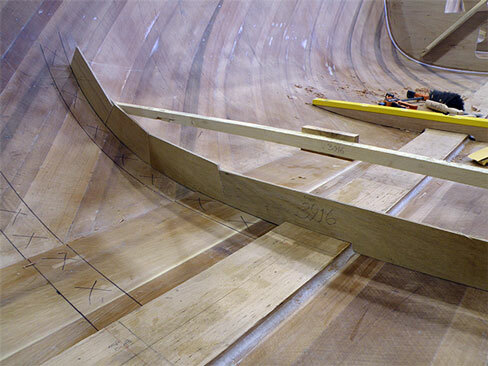 Precisely locating the piece to be fitted within the hull—that is, applying a straight line to a curved surface—tended to be a tricky operation until the advent of laser levels. An inexpensive level of this type, displaying horizontal and vertical lines, will accurately and quickly indicate a flat plane on the curved surface of the hull. Once you’ve established the principal reference lines, then putting points down and connecting those dots with a batten will denote the exact location of the finished piece. In my fitting method, one step I consider absolutely critical to its success is: always mark the large side, or face, of the piece to be fitted. For example, for a forward bulkhead you’ll mark the aft side. For a cabin sole, mark the upper face. For a bulkhead in the stern, mark the forward side. Figure 1—Fitting the lauan pattern to the hull. In the case of a cabin sole, shims must be placed on the horizontal surface to simulate the thickness of the piece to be fitted. Doing so complies with the critical rule cited above for making the pattern, namely: it must represent the large side of the piece to be fitted. 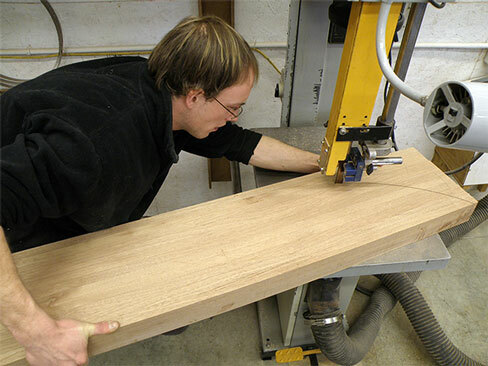 Figure 2—Laying the pattern on the floor-timber stock. Okay. We’re now ready to begin making the pattern. 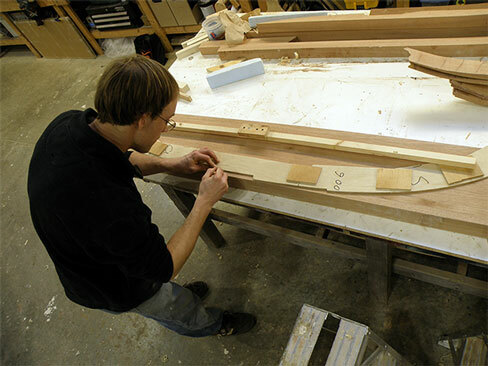 In general, if the boat has a lot of shape, then we’ll work with shorter pieces; however, as soon the target area straightens out, we’ll use longer pieces. Figure 3—Cutting out the floor timber to the traced line. Once pattern pieces are cut and fitted, you glue them together with gussets. Thus, like a big puzzle, the pattern takes shape piece by piece. See Figure 1. At this stage, the pattern should have one flat, smooth surface that will match the larger surface of the target piece to be fitted. Also, note that the pattern’s gussets are secured to one side only. Figure 4—Measuring for the bevel. To ensure that the mating, or faying, surfaces match, assemble the pattern such that when you place it on the stock to be fitted, it will lie flat. That way, you’re able to draw a line that represents the shape of the boat exactly where the large side of the target piece will lie, Figure 2. Historically, this crucial detail in the patternmaking process has always been difficult for me to get across to my students, but it’s a very important step. By following the procedure presented here, you’ll find that the pattern will reveal—before it’s removed from the boat—the finished shape of the target piece’s larger faying edge. Occasionally, after the assembled pattern is sitting in position in the boat, I’ll apply a small dab of glue to hold the pattern in place. Which means it must then be pried out, carefully. But what if the pattern breaks? That’s all right: Simply put it back into place and glue the parts together again. In my shop we don’t always follow this rule—but always wish that we had. After the pattern has been removed from the hull, place it on the target stock, trace the faying edge, and then saw to that line. Regardless of what tool does the cutting, the edge must be sawn square, Figure 3. Now bring the target piece back to the boat and place it on the line you drew in the hull. You’ll immediately notice that the “wrong” side fits perfectly on the drawn line. So, the next step is to figure out just how much material to bevel off. A small (6″) rule comes in handy here: place it on the target piece and measure the gap between it and the hull at several intervals, Figure 4. Record those measurements and transfer them to the opposite side of the target piece when you remove it. Then, connect the points with a batten and bevel to the drawn line, Figure 5. Now comes the moment of truth, the final fit. The piece should exert a virtual gravitational pull toward its final resting place; any gaps remaining between the hull and the piece should be minimal at worst, Figure 6. If, however, you find yourself looking at large gaps, then it’s time to figure out what went wrong. The questions you need to ask yourself are these: Did I create the pattern in the right spot? Does the pattern fit tightly to the hull at all points? Assuming those answers are yes, then check the drawn lines you traced, cut, and beveled to. Is there any place where you didn’t plane or cut right to the line? Or did you perhaps cut over the line? The latter is generally the main reason why the target piece fails to fit using this method. I’m confident that following the above steps—with care—will lead to excellent results. The “mystery” of how to get that perfect fit will be solved. Just remember these three rules: lay out accurately; draw clean, precise lines; and cut and bevel exactly to those lines. Editor’s Note: Rick Barkhuff was a member of The Landing School’s inaugural class, graduating in the early summer of 1979. Like most of the Arundel, Maine, school’s attendees then and now, he explored other fields of endeavor (in his case, a stint in civil engineering, followed by forestry) before seeking an education in the marine trades. 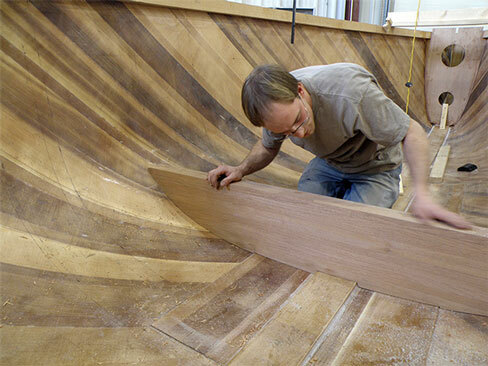 After TLS, Barkhuff worked for two well-regarded custom boat builders specializing in traditional wood construction: Jeff Fogman (Barrington, New Hampshire) and George Patten (Kittery, Maine). He also worked at a full-service yard in Portland, Maine, doing repairs on or restorations of a number of fine yachts. In 1990, Barkhuff returned to The Landing School—as faculty. Since 1994, Barkhuff’s shop has handled the “cruising boat” curriculum—one of The Landing School’s five distinct courses of study in the marine trades. Limited-production project craft in the 10-month-long cruising-boat course have included a 26′ (7.9m) “weekender” sloop, a 30′ (9.1m) performance daysailer, a 27′ (8.2m) express-style inboard/outboard-powered weekender, and currently, a 22′ (6.7m) center-console outboard designed specifically for fly-fishing coastal waters in the Northeast. All these boats have been cold-molded, with all but one designed in-house at the school. The primary requirement common to the list of project boats above is that they serve as suitable teaching tools. A second requirement has been that, once built, they should appeal to the buying public, thereby enabling the school to recoup its expenses in producing them. The latter requirement has a critical subset: a cohort of 12–13 student builders must be able to complete two or three boats (depending on the complexity of the design and the number of students enrolled) within the time frame of the school’s academic calendar, which also calls for classroom instruction and field trips. 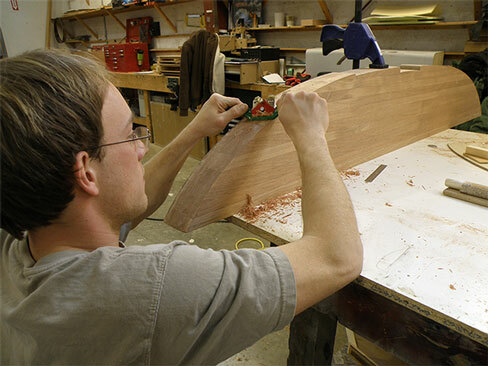 Having been associated with the school for many years as a member of its boatbuilding program advisory committee, I can attest to the fact that all the boats I’ve seen built in Barkhuff’s shop have exhibited a degree of craftsmanship in the finished product that far exceeds customary expectations regarding student work. It is within this vocational-education context that Barkhuff refined his particular method for teaching student builders a way to make things fit that removes not only some of the risk of ruining good stock, but equally important, much of the inefficiency exhibited by inexperienced employees as they ever-so-slowly whittle an athwartship piece or structural member into place. 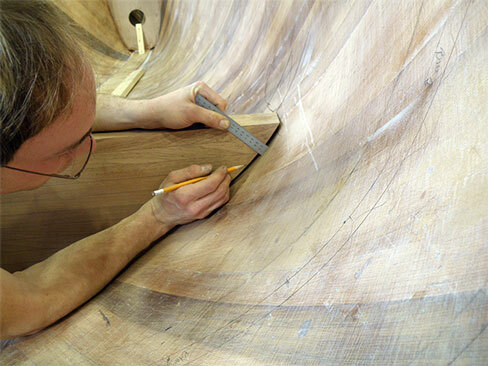 Barkhuff’s method is a blend of tips and techniques familiar to veteran boatbuilders. He doesn’t claim it’s completely new and different. He does, however, insist that . . . it works.